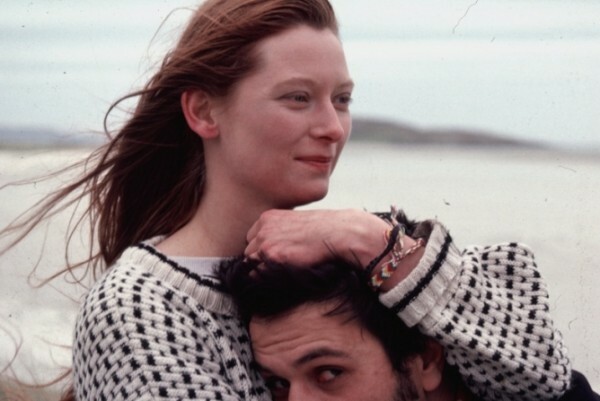 Join Bella Caledonia at The Glad Cafe in Glasgow on Wednesday 4th of May, for a rare screening of Play Me Something, a hidden gem of Scottish cinema and winner of the Europa prize at the Berlin Film Festival in 1989, the year of its release. The film is set on the Isle of Barra, in the waiting-room of the island’s airport, and features the writer and artist John Berger as a mysterious, Orpheus-like character, who enchants the waiting travellers with a tale set in Venice of love, politics and the clash between tradition and modernity. Alongside Berger, there’s a fine ensemble of actors and performers, including Tilda Swinton, Liz Lochhead, folklorist Margaret Bennett and Hamish Henderson – who plays a kind of Hebridean Prospero, riding magisterially across the sands on his horse and cart. Play Me Something is a remarkable story-within-a-story – quirky, emotionally charged and beautifully shot – and we’re delighted that the director, Timothy Neat, will be at The Glad to introduce the film and talk about his work. After the showing there will be music and song from Mairi Morrison, Margaret Bennett and other very special guests. Hosted by contributing editors Rona MacDonald and Dougie Strang, this is a fund-raising event in support of Bella and it’s work to foster an independent alternative to mainstream media. It’s also the first in an occasional series of events, widening Bella’s remit from online journalism to live discussions and performances. The evening starts at 7pm, tickets cost £10 and can be bought here.